Unfortunately my PC is 2 gigs max RAM which I'd already added 1GB to. So not much I can do then? Report auto saved to desktop. All programs slow. Can't shutdown normally when used for a while. RK very slow to open. Stuck on "searching for run" and repeated scan, same result. Let it run for 15 minutes. Please try to run RogueKiller again, but follow these instructions. After the scan has completed click on each of the follow tabs and make sure only these items are selected for removal. I ran a scan on CCleaner I've had installed for a while, but I didn't fix anything. Are you interested int the results? I am not very familiar with CCleaner. Please hold off running any scans or taking any action during the malware removal process. Making changes to the system might make the malware removal process more difficult. Click on Scan, Do Not Fix Anything at this point. PC slow all programs. Unstable. Several attempts to run RK. Each time ages to open and freezing at this point. 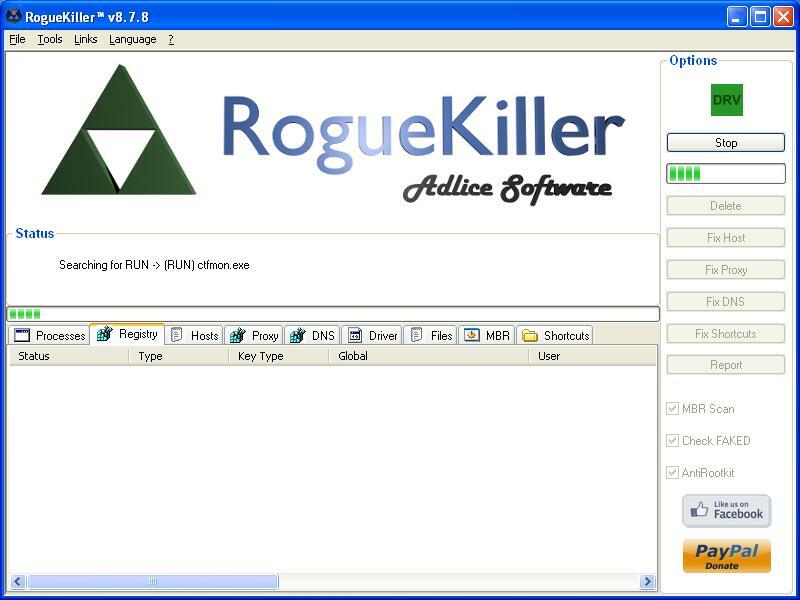 Sorry to hear you are having difficulty running the tool, please do the following BEFORE attempting to re-run RogueKiller. Disconnect any external hard drives or USB / flash drives. I don't know which version of Spybot you have so use whichever set of instructions work for the version you have. Spybot - Search & Destroy's Tea Timer. Please follow the instruction below. Select "Resident", then remove the check mark for "Resident Tea Timer"
Go to your desktop and double click on the "Spybot-S&D Start Center". Now activate the "Experienced User Mode" at top by ticking the checkbox. In the area "Settings & More Tools" please click on "Services". Now start the "On-Access Monitor" by ticking the "Start" button. Close the "Spybot - Search & Destroy Services" window. If I can run RK after following the first set of instructions then there is no need to dowload the files onto another PC correct? Spybot's tea timer was already unchecked. No "run as" when right clicked rkill only "open" option. RK opened quickly and ran without a hitch. By "unstable" I mean some lighter programs might run a bit better but even they slow down after a while, and after a couple of hours use I can't shut down normally. and after a couple of hours use I can't shut down normally. Please explain what happens when you try to shut down normally. So do I need to free up some more hard drive space? I thought it was the infections I still have that was slowing the OS down? I tried to uninstall Download Accelerator Plus last night but it wouldn't let me. I mean nothing happens when i try to shut down normally, it just stays on the desktop after I click shutdown. As I have stated before, the 20% free space is just the minimum to be able to successfully run the system defrag. I understand that the only way to shut down the computer is with the power button, but each time you have to do this it is hard on the system, may damage system files. Have you tried shutting down via the Task Manager? Please download Revo Uninstaller Pro and save it to your desktop. Chose "Uninstall". When prompted click Yes. Make sure the advanced option is checked... then click Next. The program will run, when prompted... click Yes... then Next. Check ONLY the bolded items on the list then... click Next... then Yes. Click Start and My Computer. Right-click the hard drive you want to check, and click Properties. Select the Tools tab in the Error Checking section click Check Now. Check both boxes. Click Start. You'll get a message that the computer must be rebooted to run a complete check. Click Yes and reboot. Chkdsk will take a while, so run it when you don't need to use the computer for something else. Go to Start - Run and type in eventvwr.msc, and hit enter. When Event Viewer opens, click on "Application", then scroll down to "Winlogon" and double-click on it to open it up. This is the log created after running chkdsk. Click on the icon that looks like two pieces of paper to copy it and then paste it here please. Run new scans with Security Check, aswMBR & OTL for review.